A cabling expert has taken a closer look at how Apple's new Lightning connector works, and has come to the conclusion that the 8 pins on each side of the plug are dynamically assigned, likely thanks to the use of a unique chip in the iPhone 5. Peter from Double Helix Cables first shared with AppleInsider last week his discovery that Apple's new Lightning connector cables feature integrated authentication chips. He has since taken an even closer look at Lightning and concluded that the layout of the pins must be dynamically assigned based on how the cable is physically plugged in to a device like the iPhone 5. When it unveiled Lightning earlier this month, Apple noted that the new, all-digital connector "features an adaptive interface that uses only the signals that each accessory requires." But Peter's testing has shown that Apple's cable goes even further to allow for reversible use in either orientation. 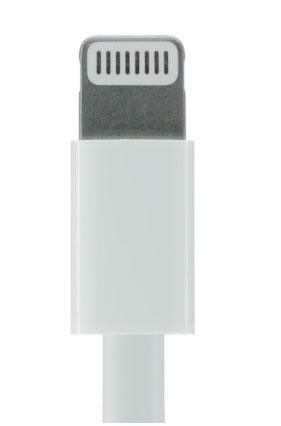 Some features of the Lightning cable, such as USB power connections, are symmetrical on each side of the plug. 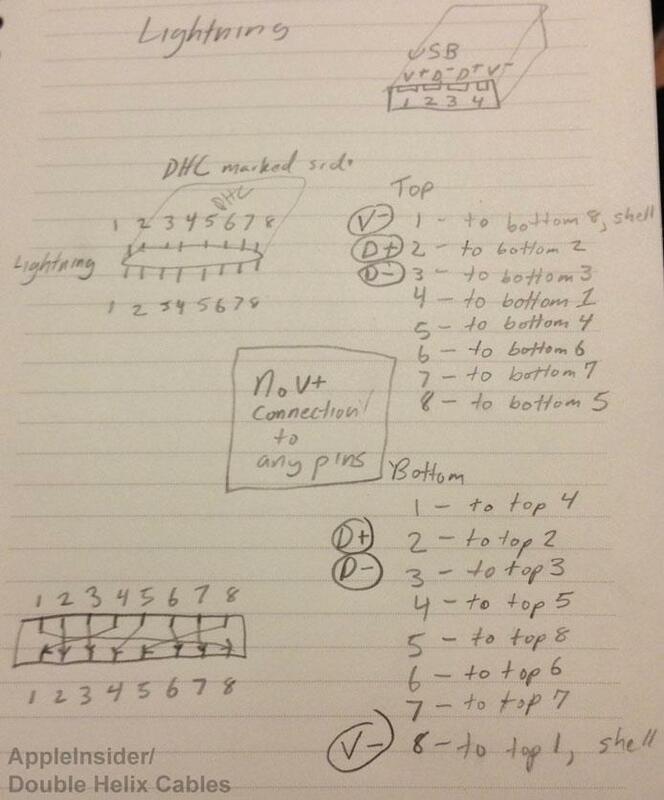 That means that if the pins on Lightning are numbered from one to eight on each side, pin one on the top row connects with pin eight on the bottom row. This allows users to flip the connector and plug Lightning into an iPhone 5 in either orientation. With this design decision, the lower right pin always makes contact with the same spot in the corresponding Lightning jack on the iPhone. However, while the USB power connection is symmetrical, Peter's testing found that the data connections in Lightning are actually asymmetrical. As such, he believes that dynamic Lightning pin assignment is performed by a chip included on the iPhone 5. Apple's new Lightning connector, as mapped out by Peter Bradstock of Double Helix Cables. Peter believes that the iPhone 5 Lightning port probably reads the type of data being sent from one of the pins, and then dynamically adjusts based on the orientation that the cable has been inserted. 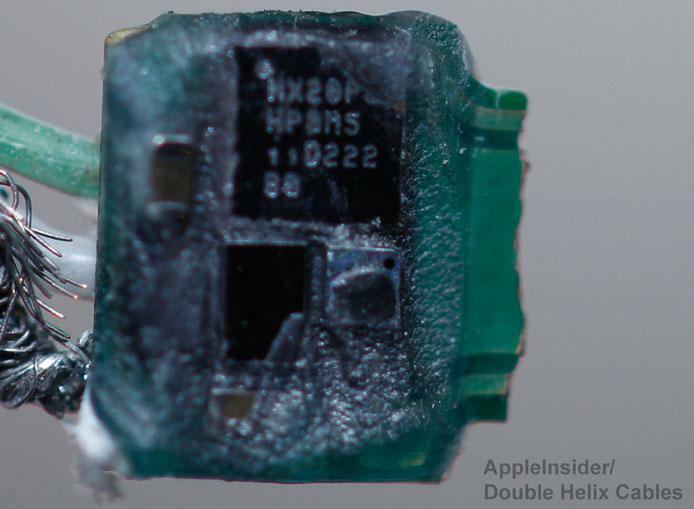 Dynamic pin assignment performed by the iPhone 5 could also help explain the inclusion of authentication chips within Lighting cables. The chip is located between the V+ contact of the USB and the power pin of the Lightning plug. Given the apparent complexity of the new Lightning plug, Apple has seen a shortage of Lightning cables following the launch of the iPhone 5. This week, analyst Ming-Chi Kuo of KGI informed AppleInsider that the shortage has been caused by a change in supplier weighting, as well as low yield rates of the new cables. The new Lightning cable and accompanying port are about 80 percent smaller than the legacy 30-pin dock connector. As a result, manufacturing Lightning cables has proven to be complex and has decreased the yield rate. The inclusion of an authentication chip in Apple's Lightning cables means consumers are advised to steer clear of cheap third-party cables that have appeared for sale online out of the Far East. According to Peter, there is "basically no way those are functional cables."